For team Fauquier to advanced six wrestlers to the state finals and placed eight wrestlers having Coach Fisher stating “Mission accomplished”. A successful season as the Falcon closed the door once again on all other teams to claim the State Wrestling Championship title. A Dream Team maybe not but will build a case why this 2015 Fauquier squad was on the path to break school and 4A state records in less than 24 hours. 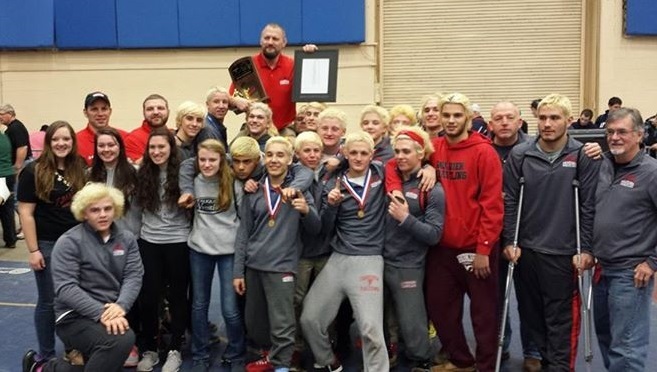 In past season there have been moments that Fauquier wrestling team had come up short with some mishaps – but the 2014-15 team had stayed health and focused all year long to finally earn its first State title. Even after taking a second place the year before you had a feeling that this year’s team had come to Salem Virginia with a hunger inside them that they wanted to win it all. This does not happen in one day and even with a VHSL tournament schedule change team Fauquier simply knew that they could still win the State title. One could argue that there were some past Fauquier teams pound for pound that could be better but none were crowned State Champions – as I do put that to rest right now. But before the State Championship tournament even got started the VHSL had made adjustments to the wrestling schedule not once but twice - on Thursday the day before and then Friday morning the day of the State Championship event. The second adjustments in some sense are what people are talking about today and for the most part are displeased with the format change. As the VHSL moved to eliminate all of the consolations bouts and made the first round of the state tournament a live or die match or you lose and you’re done – a format that has not been apply since the mid 60’s. On the bus and headed to Salem Va. Friday morning you had a feeling that team Fauquier would be alright with this decision to alter the State event to one day. Yes, in the back of anyone’s mind there could be doubt or what if I lose or simply the fear of losing your first match may slip in and fester. But the Fauquier kids have been battle tested that even coach Fisher must had felt team would overcome these morning event changes with no worries. What this meant is the tournament consolation matches would be completely eliminated. Not only would the point system change and the original top six state placements would now dwindle to the VHSL only awarding individual placements to the top four in each weight class - earning a state medal. Any team battling to win the state title would need their wrestlers to win this first round match. This truly changed how vital it was to win the first round matches. Through the past five to six years Coach Fisher’s mindset has always been preparing each kid for the end of the season State meet and that first round match. He has stated in the past “to win a state title you have to bring an Amy.” – and that’s just what he had on the Bus driving to the State Championship Friday morning. As the event changed from a two day contest to the VHSL hosting a one day event the Falcons were ready and eager to win and bring home the crown even before the bus rolled into Salem, Virginia. In some sense with the VHSL last minute format change Fauquier may have benefited from it. The conclusion of the State Championship first round matches actually had team Fauquier winning the opening eight of the nine bouts advancing those eight wrestlers into the State Semi-Finals. These results would automatically put Fauquier a head of the field as the second place team Handover could only advance six wrestlers. While Handover who also brought nine wrestlers to the States and the winner of the 4A South Region could no longer earn additional team points from three of their wresters who had lost their first round matches and were eliminated. One simply could say very tough draws and part of the after effects that occurred with these changes. During this first round Fauquier also earned four pins and one major that allowed an extra 9 bonus points. First round pins came from Kyle Budd, Tyler Foster, Matt Raines, and Garrett Tingen. With eight wins team Fauquier clinched the open round lead over Handover by 11 points with a team score of 57 points as Hanover would rest with 46 points. As we look at team Fauquier closer it was evident that the first major team achievement would be advancing eight wrestlers into the 4A State Semi-Finals - the most in teams history dating back to last season when team had three in the State Semi’s. In addition, as the 4A states rolls through its second year of existence one can say that this is also a 4A state record as well. Did I state I would be presenting facts and a case why this year’s Fauquier team would be the best team ever? The Semi-Finals round is when team Fauquier actually had its break out round as they advanced six Falcons onto the State Finals. Two major wins in this round would standout from team Fauquier were freshmen Kyle Budd and sophomore Kyle Roche. For any team to have a freshmen or sophomore to advance to the state finals is a major accomplishments and does not occur often. We would have to go back 10 year ago (2005 - David Yost) was the last time team Fauquier had a freshmen make it to the state finals. But for Kyle Budd to be paired with the returning state runner-up from a year ago and a wrestler from Handover HS made the steaks even higher for Budd to win and bolster team Fauquier in winning the state title. That’s just what this freshman did and made a statement while doing it. In all my years following team Fauquier this maybe one of the biggest moment and there are many. In Kyle Budd’s Semi-Finals match verse Gray Hart of Hanover he was able to lock-up a near side cradle and turn Hart over to his back in the open seconds of the 2nd period for a pin. One would have to see it from a far to witness the coaches and fans erupt in joy and excitement with this win. A major win and an instant during the state meet that made for the state title to move into Fauquier grasps as well. But this personal moment for Kyle Budd must have been just as shocking to say the least - a win that pushed him into the state finals as a freshman. Some could say Budd actually made it look easy. Another enormous victory for team Fauquier came from Sophomore Kyle Roche who battled to dominate and win a huge 9-3 win over Tyler Flora also from Hanover. Roche beat Flora late in the regular season in close overtime match as both wrestlers had the skill level to win the 2015 state title. In this semi-final match Kyle Roche control Hart only giving him three escapes points as Roche showed dominates with takedowns. Going head to head with Hanover in these two critical matches and winning them both put Fauquier at an advantage and very well may have been the deciding factor that sealed the State Championship title for team Fauquier. But Fauquier also had six other matches on deck this round as Coach Fisher’s army needed to fight and have their hand raised as well. Another close and important Semi-Final match came from Senior 120 pounds Daniel Ariola. Ariola won a very tight and close 4-2 win over Blake Justice from Jefferson Forest. Justice winning the 4A North Region the week before as Ariola earned the first period takedown to go up 2-0 as both wrestlers were over the top aggressive through the three periods of play. This very well may have been one of the closest and important wins for the Falcons at the state meet. Ariola a state champ last year had to dig deep to hold off Justice to seal this victory and advance himself to the state finals. Also earning semi-final wins were Senior 138 pound Matt Raines who won a solid 5-0 win over Anthony Rubliar of Jefferson Forest. Raines was in complete control through this semi-final match. Fauquier 152 pound Garrett Tingen kept his winning streak alive and won by pin over Jimmy Woznak of James Wood. Junior Clifford Harrison 160 pound competed hard and also wrestled through three periods to win a convincing 10-4 in his semi-finals match over Jacob Brooks of Amherst. Both Raines and Tingen like Ariola would also be returning to the state finals for the second straight year as this would be Harrison first trip. The 2015 state meet may had lost the luster on what it means to be in the State Finals as there was no walk of champions, no spotlight on the wrestlers, and no presentations and announcements of season career records with those past state and national ranked wrestlers. The coaches did not even have time to change into a white button up shirt and tie much less having the Salem Civic Center break down the to a single final mat for each Championship Finals. That’s right the VHSL had their backs against the wall in hosting a State Championship tournament on a single day that there was not even time for the Civic Center to clear spectators from the center for the final round – in some sense I take this as a positive. No time to wait as the State Finals had to start as soon as the last bout of the Semi-Finals had concluded. The 3rd placement round also had to run during the same time as the State Finals. Running under a modified State Championship tournament called for no break in between each of the three rounds. Something may have been lost during this 22 hour State Championship event. A road trip that had team Fauquier departing on a charter bus and leaving Warrenton at 7:30am Friday morning and rolling back onto campus Saturday morning - at 5:30am. That's right the weather that played a role in Fauquier winning the state title also caused the team bus driver, parents, fans and wrestlers to leave Salem, Va close to midnight to get back home before the Saturday snow storm arrived. Okay I may have gotten a little off track with this story but needed to express my thoughts on what was lost in this 2015 State Championship season - but let me remind all and get to the core that Fauquier had another record breaking six state finalists - most in school history and most in the 4A States. When the wrestling State Finals did start team Fauquier had a commanding lead with 109 points over Handover who had 82 points. Okay the door may not have been shut but when you have three Fauquier returning state champions in the state finals it may be okay to think that it’s over in the back of your head – I sure had this thought. Fauquier did clinch the state title shortly into the second bout of the final round as Sophomore 113 pound Tyler Foster won by pin over Cliff Conway of Courtland and earn an individual third place. Even though Fauquier still had many more matches to wrestler this pin by Foster sealed the State Championship title for team Fauquier. Team Fauquier followed Foster win by splitting the final bouts. In the 120 pounds finals Daniel Ariola won a close 10-7 match over James Boone of Nansemond River; 138 pound match Matt Raines won a 10-2 match over Mark Weinstock of Chancellor; and 152 Garrett Tingen won his state finals by pinning Joseph LaRock of Woodgrove. Tingen recorded three pins during the state championship event as these three wrestlers also became Fauquier first two time individual State Champions. Ending the season with three wrestlers earning the status of a 2x State Champion which of course is another reason why this 2015 team is one of the best Fauquier teams ever. Q: After taking 2nd to Hanover in the States Championship last year (2014) by 5.5 points – What feeling do you have right now - one year later and winning the 2015 state title? Fisher - "I felt a mix of excitement and relief. I was excited that we were able to do something that had never been done by a Fauquier Wrestling team. The expectation was that it was our year to win, and I was relieved that the guys performed up to their capability." Q: Having 8 wrestlers placing and 6 in the State Finals – Team and 4A records; any comments to these achievements? Fisher - "It is a huge testament to how hard they guys worked and the time that they put in. They are the core of the team, and they are the ones who put in the extra time in the offseason. I’m proud of the commitment that they have shown, and am encouraged that it paid off for them." Q: The first Semi-Final match of the evening 106 pound match between Kyle Budd verses Gray Hart of Hanover – How huge of a win was this? Can you explain what happen and excitement you must had felt to be mat side and see Budd win. Fisher - "I think I would have been able to dunk a basketball based on how high I Jumped out of my chair. It was an awesome moment for the team and for Kyle. His match was the most pivotal of the entire tournament, and he pull out a win by fall." 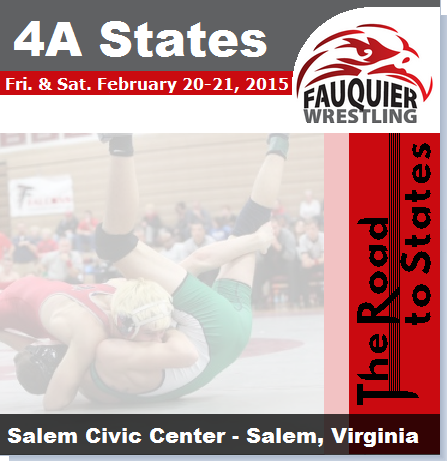 Q: Having three 2x State Champions all on one team – the first for team Fauquier any reflections with this? Fisher - "These guys have bought into the program and have the desire to win. I think it shows that Fauquier will continue to a force to reckon with for the foreseeable future." Q: In your eyes – Is this the best Fauquier team ever? Fisher - "It’s hard to say. There has been a bunch. This team certainly is up there. We beat 2 top 50 teams in the nation at the VA Duals this year, combined with our best team finish at the VA Duals and with all the stats cited here, one could make that argument." 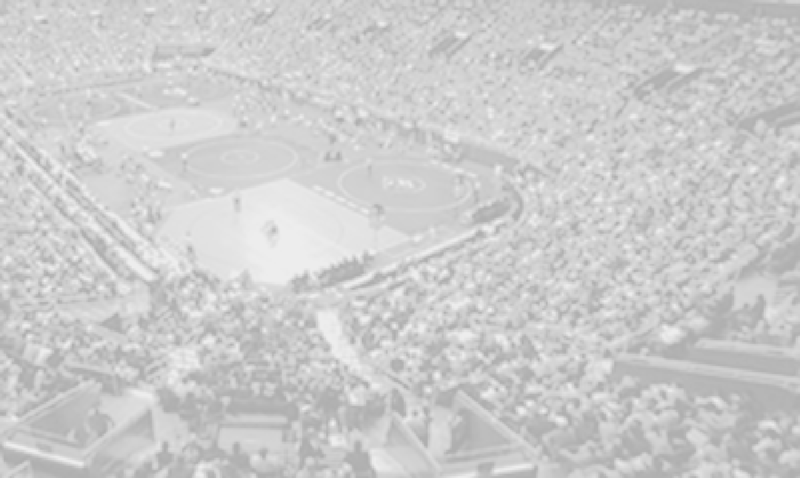 Q: The one day State tournament – do you have any thoughts on this? Fisher - "Hope it never happens again!" As you go and look at the VAWA state rankings they are somewhat accurate with regards to the top three teams in the state. As Fauquier wins its first ever 4A state title in school history and currently is ranked 3rd in the state of Virginia you then find Christiansburg the second ranked team in the state who also wins another 3A title as Colonial Forge the number one rank school wins the 6A state title. All three school wrestling in their separate classification divisions prove to show dominance. No other public or private school can really compete with these three but not here to write or compare other schools simply to express the sweat and hard work team Fauquier has accomplished to win this year’s state title. To be able to witnessing Coach Fisher this season micro-manage team Fauquier and win the 2015 State Championship title under these extreme conditions is something amazing. Some may say that the VHSL may have tried to setup teams for failure and the opportunely for individuals to succeed and place was limited. Regardless this was a Fauquier State title run that will be remembered and talked about for years not only the first for team Fauquier but THE BEST Fauquier team to ever to step on the mat – case closed. Round Results: Team went 6-2 and advanced 6 wrestlers into the state finals.